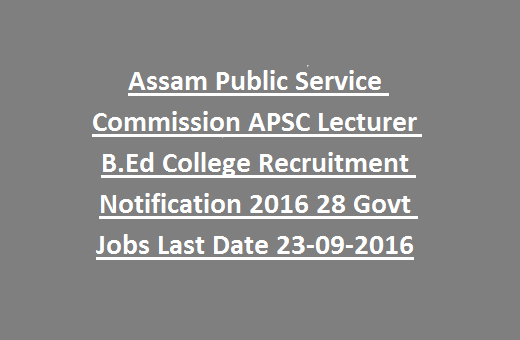 APSC Lecturer Recruitment-2017: Assam Public Service Commission has been invited application from the candidates belongs to Assam State for the recruitment of Lecturer jobs. APSC is going to recruit this Lecturer jobs against vacancies available in CTEs/IASEs/B. Ed Colleges under SCERT of Assam Elementary Education. Selection for Lecturer recruitment of APSC will be held based on written test or personal interview. Eligible candidates can send their application form in a prescribed format to be reachable to APSC office on or before 23-09-2016. 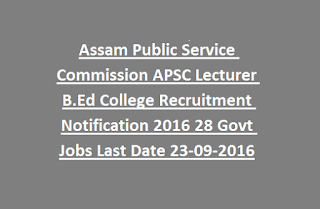 More details regarding this APSC Lecturer Jobs complete information is given below. Last Date to reach application form to APSC is 23-09-2016. There are total 28 vacancies available in CTEs/IASEs/B.Ed Colleges of Assam State Elementary Education Department. Lower age limit is 21 years and upper age limit is 43 years for all the posts as on 03-03-2016 and for SC/ST candidates 5 years of upper age relaxation is given. Candidate must have completed Masters Degree in respective Subject with at least 55% of marks from a recognized university and must have completed M.Ed with 55% of marks. Candidates should have at least 5 years of teaching experience in secondary Education. Preference will be given to the candidates who are having the Ph./M.Phil Degree. Selection for this Lecturer recruitment will be held based on written test or personal interview. If applications are received very large number then a multiple choice objective type test will be conducted with prior notice otherwise only personal interview / Demo and certificate verification will be conducted. Eligible candidates can download the application form from official website of APSC's website @apsc.nic.in. Filled application form along with self attested copies of Educational certificates, registration certificate, caste certificate and experience certificate, if any other related documents. Filled application form to be reach the Assam Public Service Commission office on or before 23-09-2016. On Cover letter mention clearly "Application for the post of Lecture, B.Ed College, Subject-----------"